With LIP LUSTRE, everyone gets to join the Perfect Lip Club! 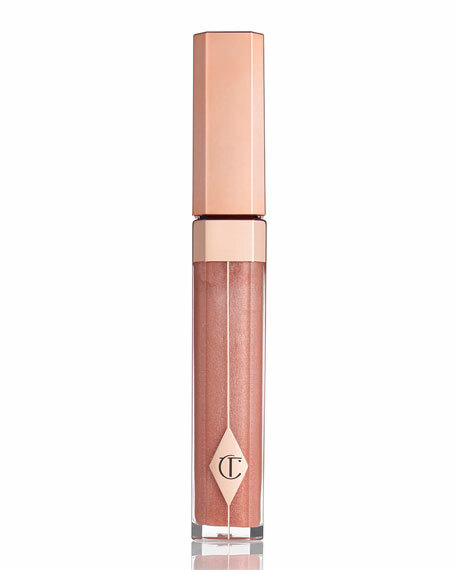 No matter what age lip gloss creates the anti-age optical illusion of fuller lips. LIP LUSTRE is a super luxe, high-gloss lacquer that gives lips a brilliant mirror-shine finish, creating the illusion of a 3-dimensional, voluptuous pout. Apply this pure, unadulterated colour in an XXL creamy texture to your entire lips to plump, boost and coat for an enviable pout to be lusted after. The creamy-vinyl texture is enriched with Lotus Flower extract, an antioxidant that protects, hydrates and soothes lips for a gorgeous, perfect, lacquered finish. For the day, cheat your lip shape using my LIP CHEAT Lip Liner in PINK VENUS, then glide the lacquer over your lips. For an amped-up evening look, apply LIP CHEAT Lip Liner, and layer the lacquer on top of the complementing K.I.S.S.I.N.G lipstick in COACHELLA CORAL. 3.5 mL/ 0.1 fl. oz. For in-store inquiries, use sku #135518.